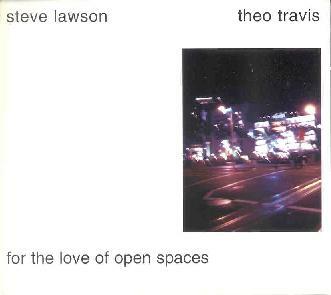 Steve Lawson & Theo Travis - "For The Love Of Open Spaces"
Lawson and Travis first played together at a looping performance in Norwich, and the success of that gig, combined with the discovery that they lived in close proximity to one another, resulted in For The Love Of Open Spaces. All the tracks were improvised in the studio, with the duo looping and layering in real time to produce a large ensemble effect... no overdubs, no synths, no midi triggered sounds. Other than the 4 minute "Lovely", a pleasant jazzy sax & bass piece, all the tracks are lengthy excursions that allow the musicians to stretch out and explore. The aptly titled "Flutter" opens the set and consists of beautiful flute phrases, augmented by the more potent and rhythmic bass. The music is light and easy paced, but there's a great deal happening melodically and in terms of the sounds the musicians produce. Flute and bass are recognizable as such, though various fluttering, warbling and assorted other methods of manipulating their respective instruments makes the music very much an experience of pure sound, which is a hallmark of all of Steve Lawson's albums. "In A Place Like This" is probably the most "rock" oriented track of the set. Part of this is due to the lazy jamming bass style. But we've also got Travis' sax leading the way with its dreamy Bluesy phrases, though Lawson soon joins in with some light but tasty Blues soloing, and Travis brings in the flute to help keep things firmly in dreamland. And listen closely because throughout the tune we hear lots of fun freaky sounds peppered about for embellishment. Among my favorite tunes is "Uncle Bernie". Dig that funky wah bass! And when Lawson starts to solo you'll swear he's taking off into the stratosphere on guitar. This is the track where things really start to get heavily layered, the result being a gorgeous slab of cosmic funky jazz. Another highlight is "Blurred Vision", which travels in a jazzy meditative realm that drifts along, playfully exploring the aural landscape and leaving its brushstrokes along the way for nearly 14 blissful minutes. Honestly, this is seriously trance inducing, and to think that only one bass and flute are producing this symphony of angelic sounds is jaw dropping to someone like myself who is clueless as to the mechanics involved in creating these layered effects. But hey... that makes it all the more magical doesn't it? And speaking of bliss, the equally lengthy title track features the most purely cosmic music of the set. Lawson and Travis abandon most of the conventional sounds of their instruments and take us on a voyage to the stars filled with the kind of beauty and majesty that classic Prog/Kosmiche music was known for. In summary, there's a lot on For The Love Of Open Spaces that will appeal to a diverse crowd of tastes. For me it's great hearing instruments like sax, flute and bass being used in creatively unconventional ways. Travis has been involved in a variety of notable projects and I've been following Lawson's work with interest ever since I heard his first album, And Nothing But The Bass. A excellent set of truly inspired improvisational music. For more information you can visit the Pillow Mountain Records web site at: http://www.pillowmountainrecords.co.uk. Visit the Steve Lawson web site at: http://www.stevelawson.net.